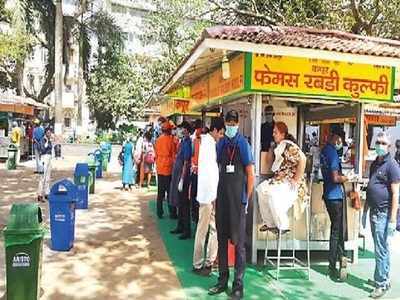 MUMBAI: Love street food but worried about hygiene? Worry no more if you are at Juhu and Girgaum Chowpatty, says the state’s Food and Drug Administration (FDA) as fast food stalls on the two beaches have got a ‘Clean street food hub’ tag. After Ahmedabad’s Kankaria Lake area, Mumbai is the second city in India to bag the certification from the Food Safety and Standards Authority of India (FSSAI). The FSSAI granted the tag to the stalls at these popular beaches last week after they cleared the final round of audits. Around 80 stalls in Juhu and 30 at Girgaum Chowpatty that offer pani puri, pav bhaji, sodas and gola were overseen by the FDA while effecting process changes over the last six months. “The tag is a seal of assurance that the food has been cooked in clean condition, following standard hygiene practices, and is absolutely safe to eat,” said Pallavi Darade, commissioner, FDA. Chief minister Devendra Fadnavis will unveil the Girgaum hub of these clean food stalls on Tuesday. FDA’s joint commissioner Shailesh Adhao said that the vendors were taught and trained about hygiene practices, starting from cooking in clean water, wearing caps, aprons and gloves, ensuring personal hygiene and appropriate garbage disposal, demarcating cooking and non-cooking area, and pest control. “The FDA also helped them refurbish their stalls, light them up properly and select raw material,” said the commissioner. The owners had to get medical fitness certificates for their staffers, which is one of the key requirements of the Food Safety Act. Adhao said stall owners have been taught about the Act and penalties that any violation could attract. They will be audited by the FDA every three months. FDA’s next step is to push more street food vendors to get the certification from FSSAI that started the initiative across country last year under Project Clean Street Food. Darade said corporates too have chipped in to provide potable water by installing purifiers.